Model T Ford Instruction Book. 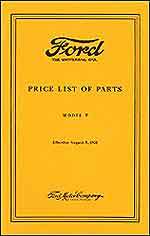 This is a high-quality reproduction of the manual that was issued with your 1926-1927 Model T.
Body parts list for the 1923 Model T Ford open and closed cars. Covers details of body construction, with cut-away drawings. 39 pages, 13 illustrations. 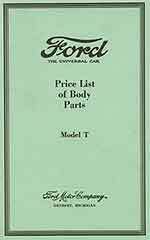 1915-27 Model T Ford Parts Body List. Completely illustrated parts list, with 93 detailed pages and 37 illustrations. Model T Windshield & Body Glass book. Includes diagrams and dimensions. Covers truck and passenger cars with original catalog and factory numbers/ with a chronological index. 14 pages/ 47 illustrations/ published March 15, 1927. 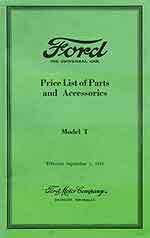 The most complete parts list for the Model T Ford. All chassis parts are listed by part number. 39 pages, 14 illustrations. First published September 1, 1921. Includes T-truck and ruckstell axle sections. 55 pages, 62 illustrations. First published August 5, 1928. 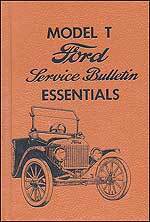 "Model T Ford Service Bulletins Essentials." 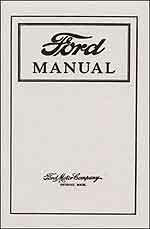 This manual is a high-quality reproduction of the service bulletins printed by Ford to help Ford mechanics at the dealer repair cars and trucks. Hardbound with over 500 pages. 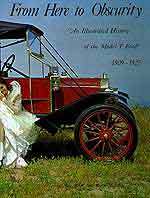 "From Here to Obscurity: An Illustrated History of the Model T Ford 1909-1927" This hardback volume is the authoritative Model T history. Inside, you'll see a year-by-year breakdown of the changes in the cars & trucks. A reprint of the original book that came with the 1915 - 1925 Model T Ford when it was new. Includes information on the operation and maintenance of the vehicle in a question-and answer format. 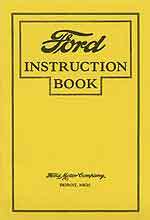 Model T Ford Service, Detailed Instructions for Servicing Ford Model T Cars 1909-27. 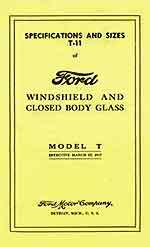 A reproduction of the book written by Ford to help its dealers repair the Model T.